Lucky are those grandchildren, who get to spend time with their grandparents, listening to the lovely stories and receiving the unconditional love from them. Even our B-town kids are enjoying their special time with grandparents, and undoubtedly, these little ones are the center of their universe. Soha Ali Khan and Kunal Kemmu’s daughter, Inaaya Naumi Kemmu who turned one on September 29, 2018, has been ruling the hearts of millions with her adorable smile and curious looks. 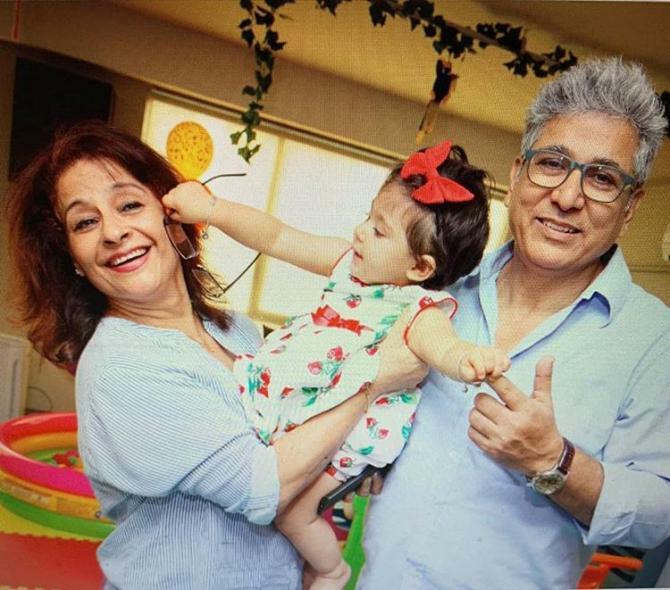 Inaaya has been fortunate enough to be blessed with the irreplaceable and unconditional love of her Nani, Sharmila Tagore, dada, Ravi Kemmu and dadi, Jyoti Kemmu. While scrolling through the social media, we got our hands on a lovely unseen photograph of Inaaya sharing a ‘moment of love’ with her dadu-dadi, and the snap was shared by her grandpa, Ravi Kemmu himself. The joy of holding and cuddling their granddaughter in their arms is clearly visible on Ravi and Jyoti Kemmu's face. Soha celebrated her 40th birthday on October 4, 2018, and sharing the best birthday gift that the birthday girl received from Inaaya, Kunal captioned the snap as, "The warmest and the cutest hugs are never in short supply with this little monkey at home. The Bestest Birthday hug." Soha hugging her daughter, Inaaya tightly is a sight to behold.